Rooftop Beer Yoga on August 16thth – Beginners and all levels welcome! $25 OFF an 80 Minute Massage at the Spa@IC: August 1st – August 15th! We’re Making Improvements! Three Squash Courts Under Renovation! Join our Smoothie Club! Buy 10 Smoothies, Get 1 Free! 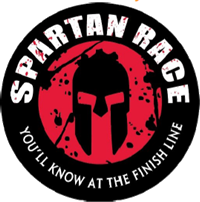 “This is Sparta!” – Join our LSF Team for the Spartan Sprint Race on Saturday 10/20! AON Center – Stetson Entrance & Pedway Construction. There’s another way! LSF Celebrates Corporate Partner, KraftHeinz – August Appreciation Month! Through the whole month of August, show your KraftHeinz Employee ID badge at Lakeshore Sport & Fitness – Illinois Center and take advantage of our KraftHeinz Appreciation promotion. We’re glad you’re our neighbor, and we want to thank you for stopping in! Let LSF help you get over the mid-week hump as you take in views of the city and a beer with Rooftop Beer Yoga! New to yoga? This is an easy and fun way to introduce yourself – unwind and escape with other LSF members and guests as you experience an instructional yoga class for all levels. First timers and experienced yogis welcome! One beer or glass of wine included with class ticket purchase for consumption after the class – additional beer & wine pours available for $5! Pardon the construction as we make improvements to three of the squash courts on the B5 level of the club. The courts will be out of use for approximately two weeks, but two courts will still be fully functional for recreational play. For questions or concerns regarding the squash court renovations, please contact LuisS@LakeshoreSF.com. Looking for a boost after your workout or just a healthy treat? Come enjoy one of our smoothies at Press Kitchen and be a part of our Smoothie Club! Buy 10, Get 1 Free! Looking for a fun way to escape the craziness of the week and enjoy social time with friends and co-workers? 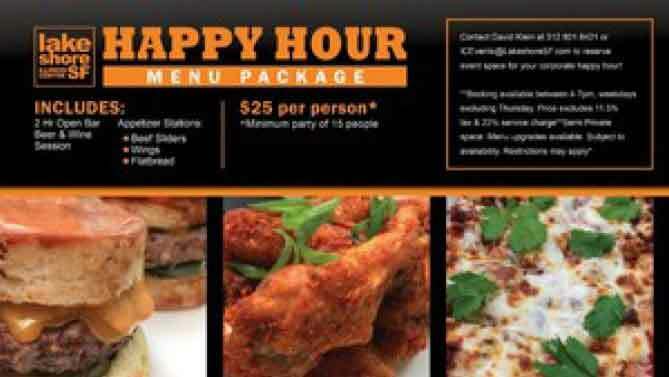 Let the good times roll and book an LSF Happy Hour including stationed appetizers and 2-Hours of Open Bar Beer/Wine for $25/person (15 person minimum). Semiprivate space and upgrades available. Some restrictions apply. Want to join Team LSF at the Toyota Park Stadium Spartan Sprint on Saturday, October 20th? Come conquer 3+ miles with 20-23 obstacles that will challenge you like never before. New to Obstacle Course Racing (OCR), there’s no better way to introduce yourself than by doing a Stadium Sprint with other LSF Members and Guests! Pricing will be determined by the amount of team members that participate. Interested in Personal Training leading up to the event, contact ICPT360@LakeshoreSF.com to learn how to decrease the cost of your race entry. Our PT360 Program Director, Matt Modleski, will be hosting a Kettlebell Basics Workshop on Wednesday August 29 from 5:30-6:45pm. 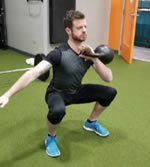 The workshop will cover basic exercises such as the kettlebell swing, and how to incorporate them into your routine. The bells are a great way to increase strength, improve cardiovascular fitness, and improve mobility. Cost is $40. Class size will be kept small, capping out at just 6 members, so please email ICPT360@lakeshoresf.com right away to reserve your spot. The Stetson Avenue entrance to the AON Center is scheduled to be under construction through most of August. This can make it difficult to get to Lakeshore Sport & Fitness – Illinois Center through the pedway. Don’t worry, there’s another way! From the North Lobby of the AON Center go through the hallway between the Starbucks and USPS toward the Fairmont Hotel. At the end of the hallway, turn left and you’ll see the orange stripe on the wall that will lead you right to our entrance. We’ll see you soon!